Yesterday migration of our main OLAP server from MS Analysis’s Services 2005 to 2008 R2 was (more or less) uneventful experience, we thought installing “SQL Server Business Intelligence Development Studio” on developers desktops running Windows 7 x64 would be as dull as migration itself. That was not the case. It took us almost half a day troubleshooting error that prevented us to open any Cubes in our migrated databases from developer workstation. Every attempt was greeted with the error “Insufficient memory to continue the execution of the program”. Everything patched to the maximum possible level as of May-21-2013. My first assumption was that something related to x64 vs. x86 miss-match between installed components is preventing VS shell to open the cube, but how if all components that need to work together are 100% 32-bit!? After I dismissed my initial hunch and some other miss-trials, I did what every self respecting systems engineer does in such situation. I went to seek some intimacy in my “cubicle”, then when no one was looking I opened the Chrome and asked Google for help. Typical day in the life of SE, don’t you think? At last I found a post from Jerry Nee in this thread, pointing to Microsoft Download Center where we can download “Office 2003 Add-in: Office Web Components” needed by MS BI Studio 2008R2 to browse the cubes. After I installed owc11.exe on developer’s workstation browsing cubes was at last possible. Many thanks to Chief Software Architects at Microsoft. Keep up with your work, as long as you’re doing your job as you do, I’m not worried to loose mine. After you install Toad on workstation with Slovenian keyboard you might find out that you can not enter pipe (|) as usual, with AltGr+W in Toad Editor. Entering AltGr+W will open “Watches” instead of displaying pipe. The workaround is simple, go to Toad menu and select View -> Toad Options… -> Toolbars/Menus -> Shortcuts. In combo box sort the content on column Category. Scroll to the “Editor” entries and find the line for command “Watches”. 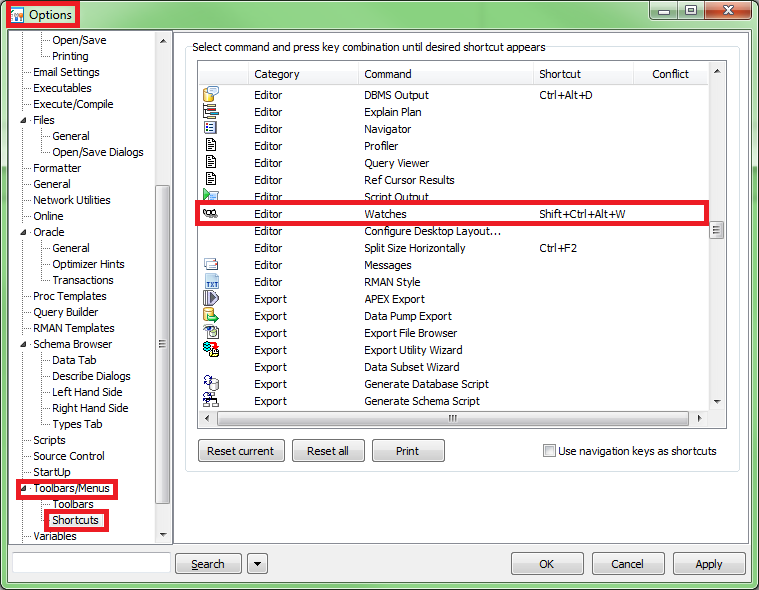 Select the line and replace default Ctrl + Alt + W with something new, for example Shift + Ctrl + Alt + W, as shown on the picture. This is apparently a bug in Toad where Ctrl + Alt + W somehow equals AltGr + W!? I was goofing around with the Dropbox sharing option, trying to find a workaround for the “implementation bug”; a sad fact that at the moment we can share folder(s) only in read-write mode. Don’t know how such fundamental flaw in a design was not addressed yet, at least not in the production version (1.0.10 as of now, December 31, 2010). However, I found some forum threads where something called “Get a sharable link” was mentioned, which allows for non-public file or folder to be shared in read-only mode. If you’re using current (production) version of Dropbox client you perhaps wonder how can you enable this beta feature. Well, after I spent a considerable time browsing various forum threads, I finally found the hint on how to enable Dropbox Sharable model. Hopefully, Dropbox team will release Sharable Model in production in early 2011, adding some additional features along the way (password protection being the most notable one). Warning! Despite the fact that generated link is hard to guess, it’s not unreasonable to expect that someone already has a script that can generate strings on the fly and then trying to open url’s, so use sharable links as a convenient feature for sharing files and/or folders of semipublic type — the ones that should not be put in official public folder, yet the World will not stop spinning if someone gets those files. Making long story short I finally found some indications on the net that video hardware acceleration might be the culprit for the problem. So, I turned Hardware acceleration completely off and problem was solved. Today I had to downgrade Firefox 3.6 to 3.5.8. Why? Firefox 3.6 breaks VMWare Server 2 web browser Console plugin (ok, I could live without that, using either IE 7 or desktop shortcut to each VM) and more importantly “My Oracle Support” flash based content. I hope Mozilla team will fix this, otherwise Google Chrome will likely become my primary web browser.